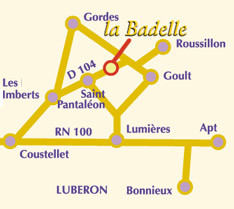 To get to La Badelle take the D900 towards Apt, turning off at Coustellet towards Gordes. At Les Imberts, turn right to Saint-Pantaléon. The house is 1km from the Saint-Pantaléon church, heading towards Joucas, Sault.